Platform is screening twice at the 50th Melbourne International Film Festival. For more details, visit the MIFF website. Platform (2000) is Chinese director Jia Zhangke’s second feature film after his naturalistic masterpiece Xiao Wu (1997). First screened at the 2000 Venice Film Festival, the film has acquired a cachet of critical praise that puts it in the class of the most eagerly anticipated Chinese pictures of the 2000-2001 film cycle, along with Edward Yang’s Yi Yi, Wong Kar-wai’s In the Mood for Love, and Ang Lee’s Crouching Tiger, Hidden Dragon. It was Xiao Wu that first made film audiences around the world sit up and take notice of the young director, born in 1970 in Fenyang County, Shanxi Province – the setting of both his feature films. Xiao Wu (also known as Pickpocket) tells the story of a petty thief, played by Wang Hongwei, whose remarkable performance of the eponymous character bespeaks the close association between the director and his actor (they were classmates at the Beijing Film Academy) and whose presence in Platform (where Wang again assumes a leading role) illustrates the continuity between the two films. Apart from Wang’s presence, both Xiao Wu and Platform are connected by thematic links that agglutinate two otherwise quite different films in terms of visual style albeit one which is characterized by Jia’s fundamental approach to mise en scène of keeping real time intact (his fondness for the long take). Though it is Jia’s second feature, Platform is the first chapter (and Xiao Wu, the second) in a historical epic about the economic changes sweeping China from the ’80s onwards, with the implementation of Deng Xiaoping’s Open Door policy. The film’s narrative spans a ten-year period from 1979-90: the period of Jia’s own growth from a ten-year-old child to a twenty-year-old adult. Jia points out that the film is a “recollection of his youth, of the period when the country was beginning to open up and experience change”. The process of change and its consequences are what we see in Platform and also in Xiao Wu which shows these effects of change into the ’90s. Jia originally intended Platform to be his first picture but for budgetary reasons made Xiao Wu first and it became his debut film. As it turns out, the two films form a diptych about China’s modern development as experienced by individuals who exist on the margins of this development. In both films, we see the inhabitants of Fenyang being gradually overwhelmed and essentially corrupted by the new ideology of materialism and capitalism, with Chinese characteristics. Superficially, Jia focuses on the ‘victims’ of the economic revolution sweeping even the backwaters of China. An auxiliary theme is the conflict between city and countryside, backwardness and development, tradition and modernity. Jia touches on all these dichotomies in his own idiosyncratic manner, given shape and substance by his screen alter ego, Wang Hongwei, who perfectly portrays the understated emotions of these conflicts in both films. Xiao Wu, for instance, is a petty criminal driven into his marginalized lifestyle by the new economic system but he is nevertheless a throwback to the old world, possessing those values (such as loyalty to a brotherhood code of honour, or fidelity in girl-boy relationships) that would seem outmoded when everyone around him has surrendered, so to speak, to the system. Wang’s performance as Xiao Wu, with his sneering expression and peculiar gait, is one of the most memorable in modern Chinese cinema – a living vision of Jia Zhangke’s idiosyncratic but highly affecting realism. Wang Hongwei’s performance in Platform is less iconic but he exerts a centrifugal role nevertheless – his character holding the film together and forming a kind of spiritual nexus for the film as a whole. As Cui Mingliang, a performing artist employed in a cultural troupe that has been “privatized” in the new economic times, Wang must share the limelight with other up-and-coming players, but he perfectly captures the essence of the awkward transition of China from country-peasant behemoth to a modern industrial society. It is Wang who stays in the mind – and I recall the scene where he does a Chinese version of a hip hop number performing in front of a screaming mob in some tank town in China’s interior regions. It’s a funny scene, driven by mockery of popular fads that is right on the nose (because it is essentially true and not marked by sarcasm) but I defy anyone not to feel a sense of pathos. Jia admits that there is something of himself in Cui Mingliang and in Xiao Wu, and it’s clear that his sympathies lie with the underdog in China’s new materialist society. His work is very much engaged with the modern realities of China and the failures and dropouts who exist on the fringes of this world. But Jia’s characters are not so much failures or dropouts as they are castaways – people who grapple with belonging to the system but who don’t seem to fit in and find themselves on the margins, but yet possessing a strong sense of self-worth and a keen value system emphasising fellowship (the character prototype being Xiao Wu, but unlike Xiao Wu, the characters in Platform have not resorted to a criminal life). As castaways from the system, they have a lot of time on their hands, for interactions and personal relationships that ultimately run the risk of fizzling out. This kind of time has been described by Raul Ruiz as the “dead time of underdevelopment” (1) – a notion of time expatiated by the Chilean director in his very first feature, the remarkable Three Tragic Tigers (1967). Jia has so far shown himself to be an expert in blocking out his characters’ existence in the “dead time” that flows out of a developing country’s capitalist experiment, as Ruiz has described it in another context. Like Ruiz, Jia is not averse to touches of populism and he derives his inspiration from popular music (the title Platform is in fact the name of a Chinese rock and roll song which is played over a crucial scene with a passing train), mixing these with evocations of popular cinema (such as the snippets of a Bollywood extravaganza that we see being shown in a cinema), and, more starkly, influences from the cinema of Hou Hsiao-hsien and Tsai Ming-liang (the name Cui Mingliang, Wang Hongwei’s character, is a hidden, perhaps unconscious allusion to the director of The River and The Hole). 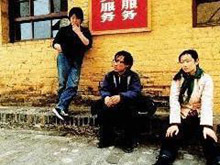 All such influences underline Jia’s own progress from a child of Deng Xiaoping’s economic revolution to Sixth Generation filmmaker: a period of personal development that transforms the dead beat of the “model revolutionary” culture that Jia grew up with as a youth to the throbbing beat of rock and roll and postmodernist film culture that now marks his temperament as an adult. Jia’s status as the most precocious of China’s Sixth Generation directors already seems to me assured (after all, he made Xiao Wu when he was 26, and that achievement has the rare impact of being both a first work and a mature work that doesn’t seem like a breakthrough, being all the more impressive as a work of a natural born filmmaker who doesn’t see the need to impress). With Platform, Jia has gone himself one better in the sense that he has masterfully integrated the dynamics of his narrative with his own idiosyncratic style. Jia knows exactly how to work with a bigger budget in the same way that he knows how to make a movie with smaller means, and in Platform he has made a truly accomplished work with all the inflections of pathos and irony that comes from his relativistic ties to Fenyang and China, in microcosm. This interview with Jia Zhangke took place in Hong Kong on April 18, 2001, following the showing of Platform at the Hong Kong International Film Festival – the first time that the film (which remains banned in Mainland China) was shown in Chinese territory. We conversed in Mandarin; the interview is translated into English by the author. Stephen Teo: In watching your movie Platform, your characters seem to want to tear themselves away from their native place, Fenyang, but they always return. Why did you devise your movie like that? Jia Zhangke: Fenyang is a pretty isolated place that has not yet opened up to the world. In fact, there’s nothing there. I think what it has is an original face of China. Personally, I was born and grew up in Fenyang. While growing up, I always had the compulsion to leave and to see the world — this is probably something common to all youths. Maybe it’s because I never lived in a big city, or maybe even in big cities like Beijing, Shanghai or Hong Kong, there are young people who also want to leave and see the outside world. As for myself, I had that same feeling. I went to live in Beijing when I was 23, and even then, I began to feel homesick for my place of birth. Such homesickness engenders a feeling of insecurity and anxiety. When I came to make movies — my first movie, Xiao Wu and now Platform — I had an unconscious urge to return to my birthplace to make these movies. I think that this feeling of home is something basic in my work — it’s a motif. On another level, my films deal with people who struggle in life and being failures, they have no other option but to return to their original place. I feel that going home is only one process in human behaviour. In following the process of growing up and coming of age, human spirituality returns to the starting point. The title Platform refers to a point of departure as well as a point to which one returns. I wanted a mood in Platform where all my characters would wander around all over the country but in the end, they would return to their original place. Nothing happens really, but at the same time, a lot has happened. ST: In movies and books, we usually see or read about Chinese people who leave their country to make new lives in foreign countries; they become prosperous and they never return. In stating your motif of homesickness, are you saying that Chinese people can never leave their birthplace? JZ: I don’t think you can ever leave. Your body may leave, that is you may live in Melbourne or New York, but your method of reasoning and all your emotions and anxieties can never depart from the place of your birth. ST: So both your movies deal with the theme of homesickness. JZ: Not so much Xiao Wu. There, I wanted to show an individual caught in the circumstances of dramatic change occurring in society. It’s often said that the Cultural Revolution was a great disaster which made victims of all of us but I think the economic changes during the ’80s were tantamount to a great revolution which is quite destructive. It’s not reformist, it’s a top-down movement; it remains a movement, just as the Cultural Revolution was a movement. In such a movement, an individual confronts many new things psychologically and emotionally and he loses his/her original ideals. For example, having gone through the Cultural Revolution, the original ideal of communism is lost. ST: Would you say that it is lost, or has it been transformed? JZ: I would say it is lost. But there are transformations in society, for example, commercial goods have come in, and there are changes in the economy. ST: Would you say that it has essentially failed? JZ: I wouldn’t say that it has essentially failed. Through running its course, it has harmed a lot of individuals. I feel that a society has to improve and develop but you can’t use that as an excuse to harm groups who have fallen into the margins. ST: Your characters, such as Xiao Wu, and Cui Mingliang, Zhong Ping, Zhang Jun, etc, from Platform, are what you would describe as marginals? JZ: Yes they are. In the midst of great changes, they can’t control their own destinies, but they are not the only ones. When they leave Fenyang to go to even more remote places, they meet many others who are marginalized like themselves. For example, the first person Cui Mingliang meets is his own cousin who is in an even more dire situation. He has to sign a contract which puts him in a life and death situation working in a mine. Once you travel outside, you come across many cases that are even more brutal. In reality, there are many people who have to pay a huge personal price. If the process of economic development, reform and opening up in China means that you have to pay such a price, then it is people like the cousin who pay the price. Xiao Wu is the same. He may be a more non-conformist character but his spirit is traditional and his sense of values is a throwback to the past. The economic reform movement has firstly put all these things at risk. He believes in honour and trust between friends, loyalty between lovers, and that blood is thicker than water between family members, but he discovers all these notions have fallen apart. He has paid an emotional price. ST: Are there no positive things coming out of economic reforms? JZ: There are. For example in Platform, we see a township set up with electricity. I tried my best to look as objectively as I can at the ten years of economic development covered in my film. There have been many improvements in material things; and in spiritual things, we are becoming more open. Popular culture is allowed to exist, and the masses are being given back their privacy. Before, we didn’t have private lifestyles, we were living in a collective. Then, slowly, you could enjoy more privacy. You could watch television, you could listen to the radio. Gradually, you could even watch Indian movies, and slowly, the country was opening up. This was the general tendency, but on the other hand, there are many negatives. ST: Are you more prone to the negative? JZ: I am more concerned with the people who have fallen into the margins. As a director, I am not into analysis. ST: You only want to observe? JZ: I only see what I want to see. Within China, I’ve been attacked by critics. I’ve been frequently accused of making films that show a negative side of China to foreigners. But I haven’t responded to such criticism because I feel that even if I have shown what is negative, I have put in much greater emotions of mine into the films. ST: Do you make your movies for Chinese or for a foreign audience? I ask this because your movies have very local features but somehow they also transcend the local and become universal. JZ: I am not willing to say that my movies are made for Chinese and neither are they made for foreigners. I make them for people to see. As human beings, we face problems that are basically the same. That’s why a film can arouse a response and understanding among different audiences. The similarities belong not only to a spatial dimension – China, Asia, the West, or Australia – but also in time. The problems we face twenty or thirty years ago are the same that we face now. For example, growing old and dying of disease is a basic problem of humanity. Or the problem of loneliness. A hundred years ago, if you felt lonely, you would write a poem. A hundred years later, if you felt lonely, you might make a movie. Such problems persist. If I have managed to go beyond the local factor in my movies, I think the most basic reason is that I have tried my best to create real human beings who possess universality or universal human emotions. These characters confer a universal significance to my movies. Like Xiao Wu in confronting all his emotions, firstly, through his friendships; secondly, in his love life; and thirdly, his relationships with family members. All these different levels of relationships, I believe, exist in foreigners. You can’t go beyond these basic human relationships, although on a more concrete level, our lifestyles and values may be different. I have always maintained that although my point of departure is my own region, I believe that my movies are not regional. They possess strong regional characteristics but they are absolutely not movies that only Chinese can understand or that only Chinese are fond of, and neither are they movies that only foreigners are fond of and that Chinese can’t understand. That’s not it. If you can capture the reality and the essence of your inner emotions, it doesn’t matter where you make your movie, be it in Shanxi Province or New York. ST: But your movies are banned inside China, and in fact, they have been mostly seen outside of China, in foreign countries. JZ: This is a fact. This is the most embarrassing and tragic aspect of being a Chinese filmmaker. Platform was shown in Hong Kong (at the Hong Kong International Film Festival) which is the first time that the film was shown in Chinese territory. This is something special to me and I felt very nervous about it. There are factors beyond cinema that have caused our films to be banned in China. ST: Is there a chance that your films will be shown in China? JZ: There may be, but it’ll take a long while before it happens. Then again, Xiao Wu is quite widely seen in China because there are pirated VCDs being circulated. So I have conflicting emotions. My film is being pirated on the one hand, but on the other hand, it is one method of getting my film shown. I feel embarrassed and helpless. ST: Let’s talk about methodology and maybe mention something about aesthetics. Your movies proceed from the premise of realism. But if I were to compare Xiao Wu and Platform, the first film is more rough-hewn and has a kind of unfinished look about it (I don’t mean this in a derogatory sense). Platform looks much more accomplished and has the feel of a masterly work about it. Would you agree with my comments? JZ: The departure points of both films aren’t the same. Xiao Wu was my first picture. Through all those years that I wanted to make films, it was the picture that set me free. Its subject matter was contemporary, happening today.at this hour and at this moment. I told my cinematographer that I wanted a sensation of being on the spot. Therefore, I had a lot of hand-held camera work, and there were many imprints of the auteur. I always say to my cinematographer that we should be bystanders. When an event happens, we are behind there looking, and we are participating. Almost two-thirds of the film was shot with a hand-held camera. ST: And most of the film was shot in long takes. JZ: In most instances, we were shooting on the streets extemporaneously. Like you said, there are many rough edges, and I wanted to preserve those rough edges. I wanted a down-to-earth, on-the-spot mood. The starting point is that the camera exists, it is at one with the event that occurs and it is present at the scene. As for Platform, the story takes place from 1979 to 1990; there is a historical sense in the narrative, and I wanted the camera in this instance to be very cool – it’s an observer and it preserves a distance between the era and the characters. I use a lot of long shots or panoramic shots, very few close-ups or middle shots. ST: And again, all in long takes. JZ: All in long takes. I wanted to preserve the methodology that we adopted in Xiao Wu. ST: But in Platform, those long takes look much neater in execution. JZ: The camera was moved back a few steps. I told my cinematographer we had to observe from a few steps back. In Xiao Wu, we were like conversing face to face but in Platform we had to retreat a few steps backwards to observe the conversation. What accounts for the difference is my relationship as a director to the subject matter. ST: Could there be an economic factor involved? In Xiao Wu, you had a very low budget to work with, whereas for Platform you had a much bigger budget. JZ: There is that reason. In fact, Platform should have been my first picture. I wrote the script of Platform before I wrote Xiao Wu. To make it, I knew I would need a huge budget, so I didn’t make it and went on to make Xiao Wu instead. It’s easier to make Xiao Wu on a small budget and to make it a good film. But for Platform, you needed to conserve something that is basic about it. ST: But if somebody were to give you a big amount of money right now to make Xiao Wu, would you do it differently? JZ: No. Absolutely no. If I had a film like Xiao Wu to make, it would still be a low-budget movie, because I don’t need that much money to make it. Why should I spend so much money to make something like that? These sort of things should be made for what they are worth. There are some projects that you need a lot of things for, like Platform, which needed a lot of lights and stage implements for those big scenes of stage performances. For instance, in the scene where the village is set up with electricity for the first time, we had to light up almost every house in that village. I needed those conditions. But for Xiao Wu, which was a very simple and extemporaneous film, I didn’t need those conditions. ST: Xiao Wu is a naturalistic work, relying on naturalistic lighting. JZ: There were some very simple set-ups where we used artificial lighting. ST: The acting was very naturalistic. You couldn’t see the difference whether or not they were acting or not acting. JZ: Right. The actors were non-professionals. They were very good and I think that’s because they really attained a state of naturalism, and I wanted also to film that state of naturalism, and they captured that. ST: Wang Hongwei, your leading man in Xiao Wu, was a non-professional actor? JZ: Yes. He was a student of film theory like I was; we were classmates. Then I used him in my first short film, before I made Xiao Wu. ST: Is he also from Fenyang? JZ: He’s from Anyang, Henan Province. ST: He’s acted in three of your movies. Would you agree if I were to say that he’s your alter ego? JZ: (laughs) I have to think about that. There’s surely something of me in the characters of Xiao Wu or Cui Mingliang. I can’t escape that.there’s definitely something. ST: Back to methodology. In Xiao Wu, did you deliberately set out to make a docudrama? Or in other words, to integrate a fictional drama with the documentary? JZ: No, I didn’t have that purpose. I made Xiao Wu according to my understanding of film. What is the primeval appeal of the image? I am very fond of silent films. They are very original and first-hand. Then, the cinema became more industrial. Each light, each movement or scene is achieved with industrial precision. They lack the flavour of an auteur or a kind of primitive creative sense. When I made Xiao Wu, I wanted to capture that sense of primitive creativity and to return to that stage of cinematic primevalism. ST: Why do you want to return to that stage of primevalism? Cinema has developed for a hundred years. JZ: Because after a hundred years, the human life force in cinema is becoming less and less. The cinema is subjected more and more to industrial standards. I think cinema should contain human flavour and the flavour of the auteur. That’s why I didn’t want something easy and smooth. I want a movie that has an accent. For example, I can’t speak standard English, I have a Chinese accent. The cinema is the same. I have my own Jia Zhangke accent. I may be too garrulous, or too vague. My camera may be shaky or it jerks too much but that’s the emotion I feel on the set. That’s the kind of movie I want to make. Pouring your life force into the movie, not conforming to a cold industrial standard. That’s why I rejected the use of certain supplementary film techniques such as steadicam or even the track – though I used a bit of that in Platform. I don’t want my cameramen to use these supplementary techniques. Because I want my camera to come into direct contact with the subject. ST: Xiao Wu seems so embedded in naturalism that it looks like the film wasn’t scripted. JZ: In fact, I wrote a much more exact and detailed screenplay of Xiao Wu than for Platform. When you work in real circumstances, you have a lot more choices. If you don’t have a complete script, you don’t know where your centre is that allows you to make your choices. In my films, I make a great deal of changes on the set and the more you change, the more you need a script. It’s the base and the coordinate. It’s like the navigation mark. With a complete and detailed script, I can make the right decisions, or to judge whether or not my choices are good or bad. ST: Your conception of sound is also very special. You design your soundtracks with a lot of ambient sound, sound from outside the frame, and there’s a lot of noise offscreen. Why do you design it that way? JZ: I feel that sound should have its own structure in a film. The narrative has a structure, the imagery has a structure, and sound must have a structure. And when sound and imagery are integrated, that too has its structure. I used a lot of brain-work in designing the soundtracks of both Xiao Wu and Platform. The structure is something very imaginative and recollective. My own recollection of a time, an environment or a person starts from a tiny portion. Let me tell you that when I work on a screenplay, I can’t write a synopsis. I must write the whole script from the first act to the last, and only after that can I give you a story outline. My films unfold from a small part of something – an expression, perhaps, of a person, or a piece of music that allows me to return to a particular time or mood. Music especially gives me a lot of inspiration, and that includes sound. For instance, if I wanted to go back to the ’70s, all I do is to think of tweeters. This is what I remember from my childhood. Innumerable loudspeakers in any one locality. A factory will have one. And the voice would read some document or rather, broadcast a revolutionary song, or announce which new official has come to work. The dormitory would usually be at the back of the factory and when the workers hear the sounds of the tweeter, they would file out. These sounds bring me back to that era. ST: In Platform, or even in Xiao Wu, you have a lot of military drilling sounds, or troops on the march. Is there a special significance? JZ: Firstly, it’s existential.it’s a recollection. JZ: You hear the sound of military drilling everyday. When I was in secondary school, I had to wake up early to go to school. Each morning as I get up from bed and then ride the bicycle to school, the army would be drilling in the camp. I grew up with that sound. Now when I made the movie, this sound is not only a natural source of reminiscence but it has assumed other significations. It’s a sort of pressure, a kind of control – and that’s the implication. It’s not however something conceptual that is added into the movie. Firstly, it’s existential and it’s my recollection. ST: There are many long takes in your movies. Is it because you are fond of them or is it because they are convenient as a form of technique in your methodology? JZ: I am fond of it. It’s a kind of hobby (laughs). ST: Have you been influenced by other directors into adopting this technique? JZ: Absolutely. Like Hou Hsiao-hsien, or Ozu. I have been through film school and to say that I haven’t been influenced by these directors would be a lie. ST: Would it be that it’s more suited to naturalism? JZ: What I like most in a long take is that it preserves real time, it keeps time intact. It allows me to film something important. If I were to cut the scene into pieces, there would be a lot more subjective things that I put in. In Platform, the characters have a relationship with time. You see two people smoking and talking aimlessly for a long time. Nothing happens plot wise but at the same time, time itself is kept intact. In that long and tedious passage of time, nothing significant happens, they are waiting. Only through time can you convey this. If I were to break up that scene which lasts for six or seven minutes into several cuts, then you lose that sense of deadlock. The deadlock that exists between humans and time, the camera and its subject. Everybody experiences the monotony of time passing where nothing that is noteworthy occurs. ST: But in watching your long take sequences, there is some other information that you want to hold back, that you don’t want the audience to see. JZ: I use a lot of long shots. If the audience can see things in there, that’s good, if they can’t, so be it. I don’t want to impose too many things onto the audience. For instance, in Platform, I used only two close-ups. One was the close-up of the postcard that Zhang Jun sent from Guangzhou. It’s not that there are special situations where I wanted to hold back some information. I don’t want to impose a message onto the audience. I want to give them a mood and within that mood, you can see things that you want, or you can’t see things. My films are rather challenging for the audience. They are not very clearly stated to the extent where the audience can see clearly the objects they want to see – this pen or this watch. If they don’t notice it, they don’t notice it. It’s not that I am being indifferent. Through all these, I am imparting a director’s attitude, how he sees the world and the cinema. What I mean to say is that it’s only an attitude because you can never be absolutely objective. When you need somebody to look at something, it’s no longer objective. There is no absolute objectivity, there is attitude, and through this attitude, there is an ideal. ST: In these long-take sequences, do your actors rely entirely on instinct, because they seem to let matters run their course, or do you have a design where you tell your actors how to act? JZ: I tell the actors what is the ultimate message of the scene. But they are free to use their own means and their own dialogue. ST: Are the lines already written? JZ: The lines are written but they can improvise. However, they must convey the ultimate message of the scene. A message can be conveyed through ten different languages. For instance, someone may say “I am hungry”. Another person will say “I wish to eat something”. Yet another person will say, “There’s leftover food at home”. All of these convey the message of hunger. You can use your own means to convey that message. The actors and their working methods give me a lot of inspiration. ST: Do you rely on rehearsals? JZ: I don’t rehearse beforehand. Everything is done right on the set. When the lights are rigged and the camera platforms are ready, we start to rehearse. ST: And when you shoot the scene, it’s usually done in one take? JZ: Right, that’s about it. When we fluff a scene, we start over again. But my shooting ratio is very small. In Xiao Wu, it was 3: 1. In Platform, it was 4:1 or 5:1. ST: What do you find are the most difficult scenes to shoot? Either in Platform or Xiao Wu. JZ: The most difficult scenes are still the street scenes where you can’t control the situation but you still need to block your actors and manage the scene. That poses a real headache, and we have to come up with all kinds of solutions. ST: I’d like to ask you about your narrative structure. Like I said before, you restrain a lot of information from your audience, not to let them understand directly what’s going on. Such a narrative structure is one that’s adopted by many contemporary directors and it seems to me to be very postmodern. Do you agree? JZ: It’s definitely different from the traditional narrative method. In Xiao Wu, there are three main sections in that film which follow a single linearity, and I am very fond of using these sorts of single linear descriptions. Say, from one to five. With my handling of it, when I reach number four, I stop, and the linearity becomes a surface plane. I can’t explain it more clearly, but that’s how I understand it. For instance, when you tell a story, you may have a character who enters, speaks his lines and then exits. When I reach another setting, I will linger there, which becomes a surface plane and I push it mechanically. In Xiao Wu, there are many dramatic moments within which nothing happens. This is maybe what makes it postmodern. In the traditional method, when a dramatic moment occurs, the drama unfolds. But nothing happens in my method. In Xiao Wu, there’s the scene where Xiao Wu goes to the wedding of his erstwhile best friend uninvited. The two protagonists face off. In the traditional method, there would be a conflict. The drama would unfold from this moment. But in my treatment, nothing happens. They say a few words and take their leave. On the one hand, there are many dramatic moments occurring in our lives, but the Chinese way of managing these moments is to restrain anything dramatic happening. We bury these in our hearts. It’s our way of crisis management in human relationships. We try our best to avoid conflict. If another director was to make Xiao Wu, he could make something quite brilliant out of all those dramatic moments. But it’s something else entirely. The brilliance is dramatic, but I don’t seek that kind of brilliance. I want to stand by life.I want to capture the real way of how we handle crisis and drama. ST: You don’t reject the use of symbolism? JZ: I don’t. For example, in Xiao Wu, the identity card is a symbol, and so is the portrait of Mao Zedong, because they really have such meanings. ST: And in Platform, what I am struck by is your use of trains. JZ: It’s already very abstract when we actually get to see the train, like in the scene where it passes by. And the whole concept of trains. ST: There’s also the sound of trains.the train whistle which you duplicate from the sound of a whistling kettle as it comes to the boil at the end of the film before you fade out. Did you deliberately design it as a train whistle? ST: So what does it symbolize? JZ: I think it’s a kind of summons. The train is especially significant for us who live in landlocked isolated places. We can’t see the sea and we are ignorant about the outside world. There are no trains in my hometown. ST: In fact, it’s very obvious from the opening of the film how significant the train is. JZ: It’s very obvious that I have an affection for trains. The train stands for hope and the future. The motif of the train is very well integrated into Platform. It is really very special. Personally, when I learned how to ride the bicycle, the first thing I did was to peddle to a distant place to look at a train because I had never seen a train. I was already in my teens. ST: What would you say if I were to describe Platform as a realist epic? JZ: I would be very happy (laughs). Because I intended it that way. ST: There are two versions of the film, a longer uncut version running over three hours, and a shorter version that runs two-and-a-half hours. Which version are you more satisfied with? JZ: I am more satisfied with the shorter version because the longer version was something that we did in a hurry. I feel sorry for my investors because I had to prolong the schedule as I was waiting for the right season. And I was revising the screenplay non-stop. They asked me to hurry up the production in order to make the Venice Film Festival, and I did so. The shorter version is a distributor’s cut. But I myself wanted to cut it down to two-and-a-half hours, the better for it to be shown in theatres. ST: What is your next project? JZ: It’s a film about a peasant who has lost his land. In China, there are village enterprises which are run by the peasants themselves. Many peasants then became workers but the factories ran into bad times and were closed down. They went back into farming but they have no more land because it has been given away to others. They have to think about ways of survival. It’s a movie about middle-aged unemployed people because that’s the most acute problem we have now. I’ve also lately done a 30-minute short documentary, In Public, which I shot in Shanxi, focusing on public places like the train station, bus station, karaoke, disco. It was shot for the Chongju Film Festival in Korea. ST: Finally, as a Sixth Generation director, how do you look at the Fifth Generation directors? JZ: Personally, the reason I wanted to make movies was due to their influence. I wanted to become a director after seeing Yellow Earth (Chen Kaige, 1984). But unfortunately, as auteurs they didn’t have a long life span. Too much was demanded of them far too quickly. In China, it’s quite inconceivable how our auteurs have changed in their creativity. Chen Kaige, for example, has made nothing that I like after Farewell My Concubine (1993). And as for Zhang Yimou, I haven’t liked any of his films.